Body art is a strangely emotive thing. Some people detest tattoos while others are very visible fans, I’m somewhere in the middle but I see both sides of the coin. My tattoos are quite personal to me and always very considered, so I don’t understand people who get something so permanent on a whim. To me, you’ve got to think pretty carefully before you make a life-long commitment. I speak from experience, after wanting a shooting star tattoo for a couple of years I went and got mine done on a whim. While I don’t regret it per se as the sentiment behind the tattoo still stands, I do wish I’d thought more about the design more. And likewise, as much as I like tattoos I don’t think a full sleeve anytime soon! After the awful tattoo debacle, it took me a long time to go for a second as I wanted to do it right. Everything from what I wanted, where I wanted it and most importantly who tattooed me was meticulously planned out. Despite being afraid of them and detesting typical girl tattoos, I decided on getting a butterfly. Butterflies are symbolic throughout most cultures; varying from a positive sign for the majority and occasionally a bad omen. For me, they represent new beginnings and metamorphasis but also embracing change and a reminder to keep faith while we undergo transitions in life. It also represents overcoming obstacles, there’s one proverb which sums this up perfectly; “Just when the caterpillar thought the world was over, it became a butterfly.”. It seems quite apt, considering my last post. After a lot of research, I decided to book into Nikole Lowe’s tattoo studio, Good Times Tattoo. 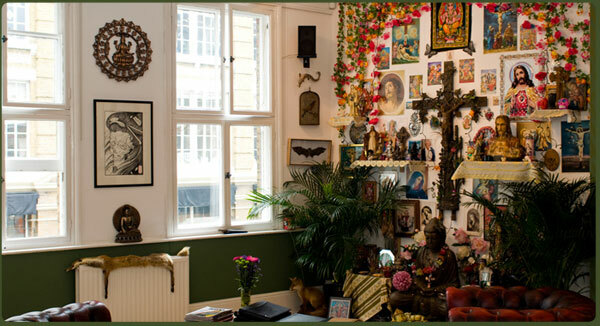 If you’ve not seen pictures, this is undoubtedly one of the most incredible tattoo studios. Located on Curtain Road in Shoreditch, you’re buzzed through a metal door and head up some stairs through to a beautiful, bright studio with tons of natural light and a cornucopia of oddities and artifacts. The focal point of the waiting area is a wall with an ornate cross, flowers and lots of images of Jesus while the rest of the studio has animal heads and preserved butterflies. I saw Jamie Ruth who is a guest artist, she was at Good Times for a couple of months last summer and started tattooing almost 20 years ago in New Orleans. I won’t bore you with details of how painful it was or wasn’t, all I’m going to say is that 3 hour rib tattoos aren’t for the fainthearted. Almost a year on, I absolutely love my tattoo. During times like this when things are tough, it reminds me to hang on in there and have faith. It won’t be long til this phase will be over and we will emerge stronger and ready for whatever life brings next. Where do you stand on tattoos? Do you have any or are you planning any? I'm one of those fuddy-duddies who really dislikes tattoos. In my experience, I have never come across a piece of body art that wouldn't look just as striking and attractive in another, less permanent context. Essentially…I don't understand the concept of putting yourself through three hours of pain, for something that might look awful in three weeks, months, years, decades, or worse, you might regret very quickly. My pet snobby hate is the "statement" tattoo – a name, a face, a date, something poorly thought out because you thought it would be funny/clever/subversive – yes, I have seen this, sadly. My opinion is probably influenced by the fact that I'm too indecisive for such a momentous decision, anyway.